Lately, it’s been too darn hot to cook! Summer has hit very hard around here with temperatures over 100 degrees for the last several days. On top of that we are having the worst drought in history with no prediction of when relief will come. One thing I have been doing is getting up early enough to cook something in the morning when the air is . . . well I wouldn’t go so far as to say “cool” . . but I figure early a.m. is when the temp is as low as it’s going to get for the day. Even so, I do not want to fill our home with heat from my stove and oven! The other evening I was through with work and even though it was rather late evening, it was still mucho calor fuera and even though I had not eaten since about 11 a.m. (only breakfast and second breakfast). I still didn’t want to eat anything. 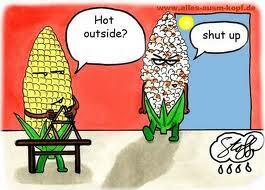 Just too hot! But I knew I would eventually get hungry. There it was—a visionary flash of the ultimate cool-as-a-cucumber-but-loaded-with savory-satisfying-flavors summer refreshment idea! So I got busy. There was a little cooking involved, but not much. 1. I minced a little red onion—very fine mince—and sauted that with a touch of olive oil until it was sweet and tender. 3. I grated a bulb of fennel and a cucumber—both organic—and added that. I added salt, white pepper and then a little unsweetened coconut milk and some nutmeg. I adjusted the salt and then chilled the soup. Surely you could play around with the seasonings. A bit of cardamom perhaps? Or go for a hit of hot chili pepper? Lovely chilled soup in three four easy steps! Now let me talk to you about the color. If you buy one of these ready-made soup stocks it’s going to be orangey-yellow because they use a lot of carrots or squash. And the flavor of this stock is very nice but definitely affects the outcome of the soup. If you think creamy cucumber soup should NOT look like pea soup, and you want a more traditional white-looking soup, you should make dashi as your soup stock. This is not hard to do at all. Then you will have a clear broth to start with. Further, if you really want a whiter soup, you could peel the cucumber before grating it and then you would have much less green color. 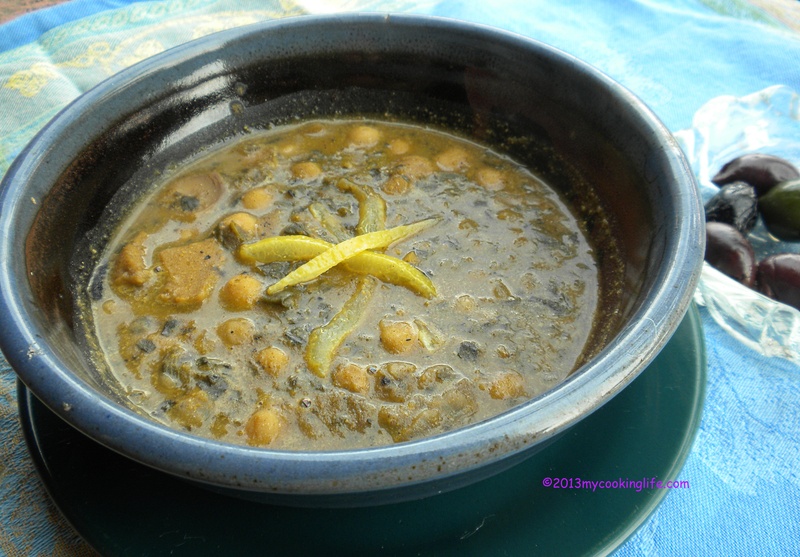 I’m sure my photo of this soup would be much more picture perfect had I done that but I was looking for something very fast so used the packaged broth and I prefer to use whole organic foods whenever possible so I generally don’t peel my cucumbers. There’s lots of good stuff (nutrients) right under that skin! When the soup was chilled, I served it to my Hubbin’ and myself. I thought probably the soup would be too mild for him and he might not like it. Wrong!! He did like it very much! We both enjoyed the flavors and felt refreshed after eating it. Another tip about this soup is that you can keep it chilled in a container for work or travel and enjoy it as is! How simple is that? Springtime rejuvenates me. I love the budding trees, the very young, very light shade of green that new leaves have. I look forward to the sweet, sultry smell of the Russian olive trees. And I love putting away the coats and gloves and hats. Here in Central New Mexico, we get to closet them for a good eight or nine months. 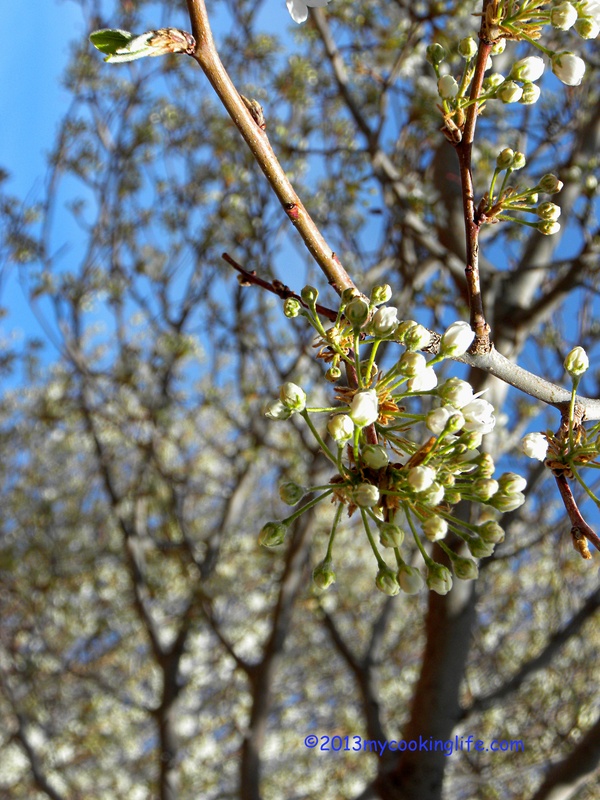 Spring is a miraculous season. This photo is dedicated to my blogging friend, Kathy, who lives in the Upper Penninsula of Michigan where she is still experiencing the need for the coats, hats and gloves. Seems like all living things are awakened in the spring—even my Christmas cactus has decided to bless us with a single bright blossom! This hasn’t happened in three years since I first got the plant as a Christmas present. It was covered in bright red blooms then, but little by little they finished their time and dried up and dropped off. Never to be seen again. 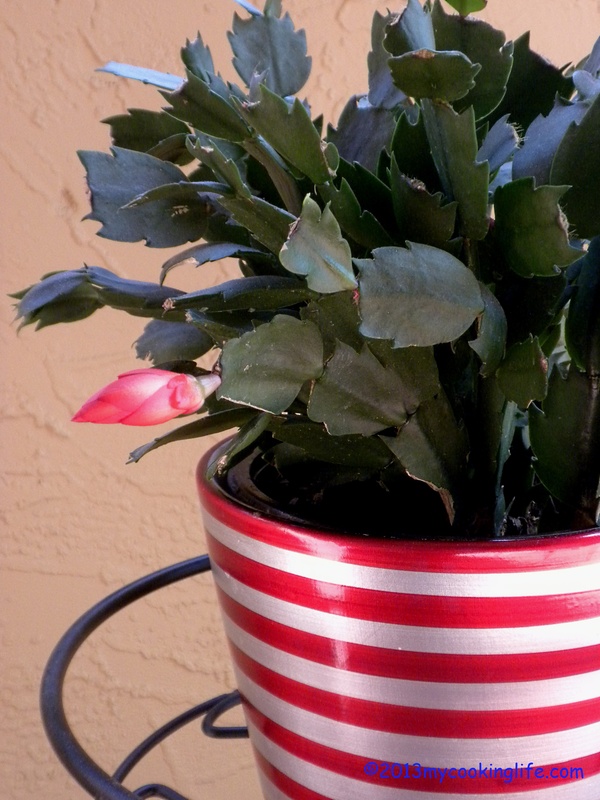 Try as I did to encourage another bloom, the Christmas cactus remained a beautiful green with new growth and a lovely vibrancy, but alas, no flowers. Until now! I celebrated with a little springtime rejuvenation of my own. 1. Make the soup stock, also known as dashi-—a Japanese-style broth. 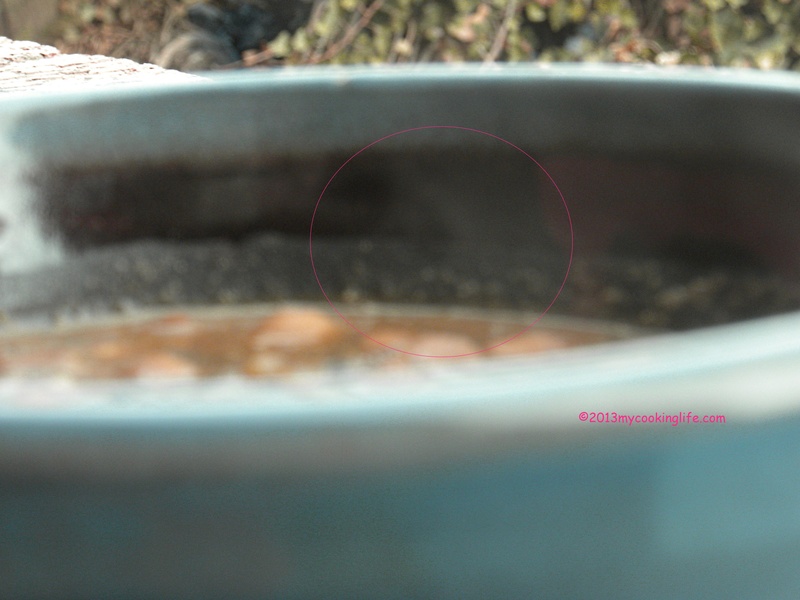 Put the kombu and spring water in a pot and let it come to a boil. Reduce heat and let it simmer for 10 minutes. The kombu has many minerals and creates a wonderful flavor for this basic soup stock. 2. Remove the kombu* and (optional) add the bonita flakes. Turn off the heat and steep the bonita flakes for a few minutes. They will sink to the bottom. Strain the stock. I used a strainer with an unbleached coffee filter inside to get all solids from the bonita flakes out. 3. Soak the shiitake mushrooms until they are soft. Remove any stem pieces. The stems are not generally used because they remain tough. Slice the mushrooms very thinly and add them to the strained stock and bring to a simmer again. Let it simmer while you prepare the tofu. 4. 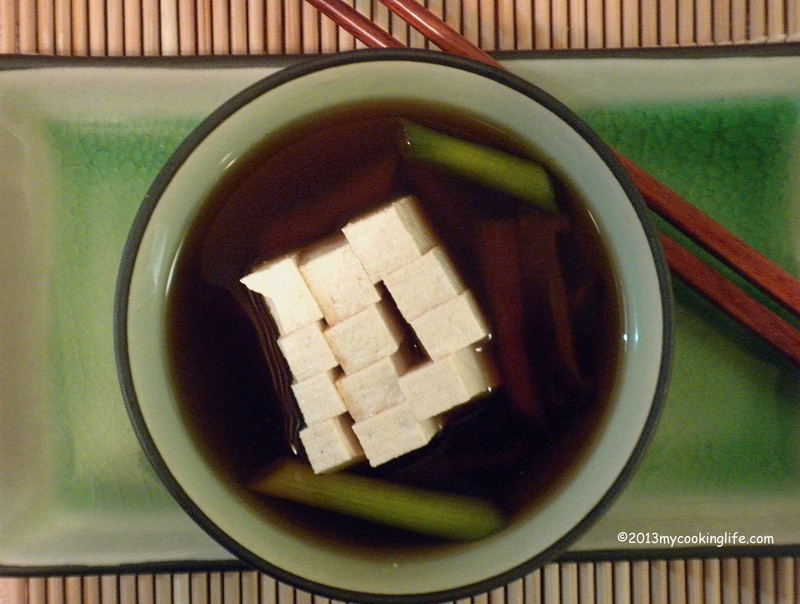 To prepare the tofu, you can cut it into bite-size squares. Use whatever amount you wish but for me, I’m making this a light, light soup and I don’t want a lot of tofu. I decided to make a single large piece of tofu for each bowl by cutting the tofu into six big chunks and then making partial cuts in each chunk creating a sea anomone effect. Use chopticks or wooden spoon handles to prevent the knife from cutting all the way through. Place the tofu pieces into the broth. Use the chopsticks to keep the knife from slicing all the way through. 5. Season the (still simmering) soup with soy sauce–just enough to give a light flavor but not enough to be salty or overwhelm the flavor of the broth. The best way to judge this is to taste your broth each step of the way so you know what the flavors are and won’t overdo the shoyu. 6. Wash the scallions and remove the roots. 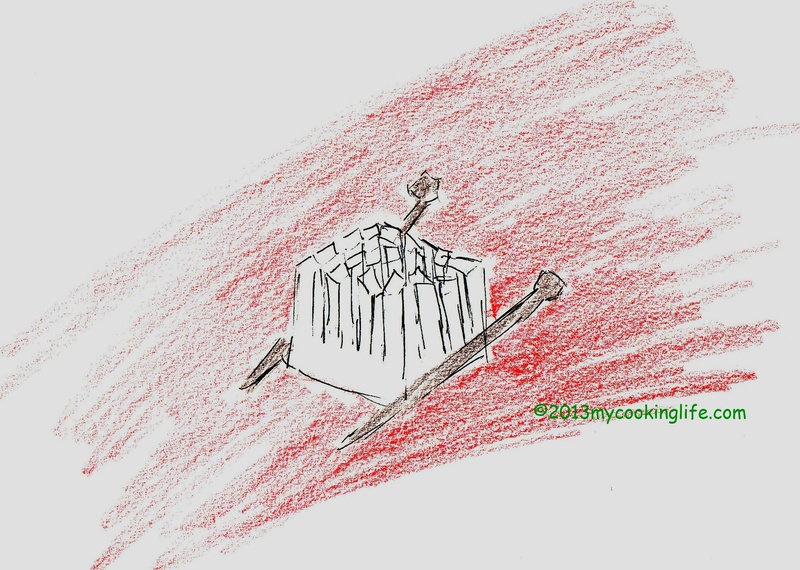 ** Make a small verticle slice in the little white bulb of the scallion, then cut on an angle to create 1-inch pieces. I like to use the white part and the lighter green part but not the dark green ends. You aren’t really cooking this; just put it in the hot soup, turn off the heat and it will become a beautiful bright green just like the new spring leaves outside! Dashi makes a light and flavorful base for your springtime soup bowl. 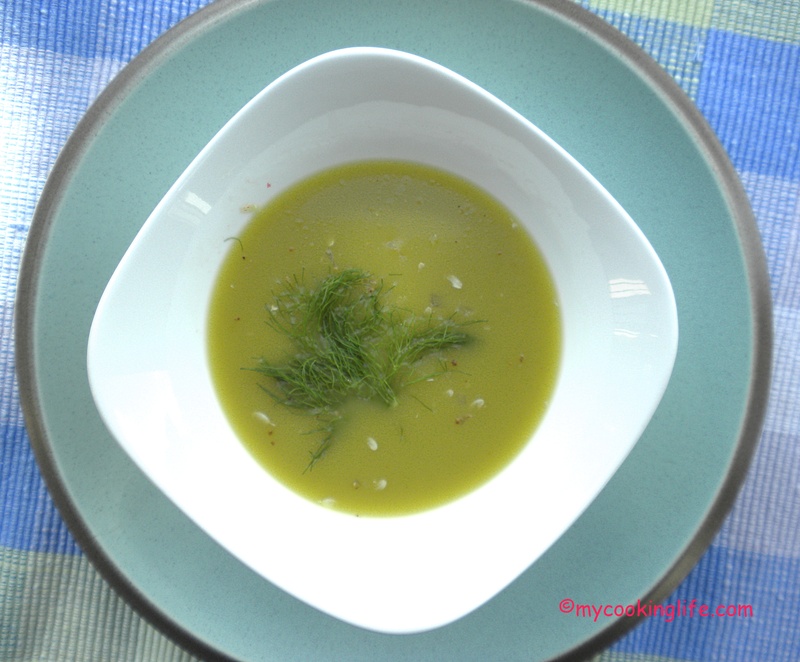 *Save the kombu you used for the broth and add it to another soup or vegetable dish. ** If the scallion roots are nice and fresh, as they often are in the spring and early summer, you can store them in a glass of water in your refrigerator and use them to flavor soups. Just chop them up very fine and add them in!